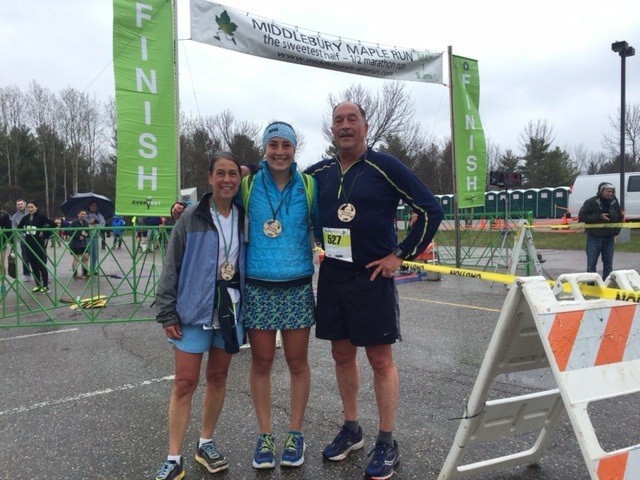 The Middlebury Maple Run is tagged as "Vermont's sweetest half marathon and relay." It's a great run, and is becoming a destination run, which is great for the town and the State. I'm late in posting this, as it's scheduled during the Spring sugaring season. The weather didn't exactly cooperate this year, but it looked like everyone was having a great time anyway, and it was nice running weather, really. 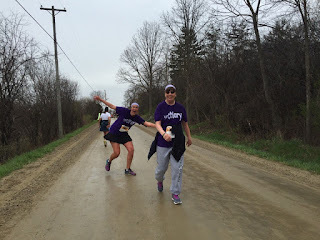 And, Kathryn got her friend Mary to do the race with her, or at least part of it. Kathryn has been very active with the Special Olympics all four years here, and she convinced Mary that she could do this! Kathryn and Mary did it as a relay, although Kathryn did the whole thing by running the first half, and then walking and jogging the last half with Mary. Great job, ladies!! I'm so proud of Mary for finishing, and Kathryn for encouraging and supporting Mary with her goal! Excellent job, everyone. Way to represent, MCVB family! !